Directions: From Port of Spain, head west to Carenage/ Chaguaramas. Just after CDA Police post (Pier II), turn right (north) onto Tucker Valley Road towards Macqueripe beach. Continue pass road to Chaguaramas golf course (Bellerand Rd) on left, then turn right just before Samaan Park parking lot (on right). Continue on road and turn right (at gate/ barrier) to Arboretum. Reminder: If you get to the run site after the pack has left (and are out of sight), please do not attempt to find the trail on your own. DIRECTIONS: From Port of Spain head West onto Western Main Road heading to Carenage/Chaguaramas. Pass through CDA Police Post/Pier 2 and on your left after Five Islands Amusement Park is Chaguaramas Military Museum, the Run Site. 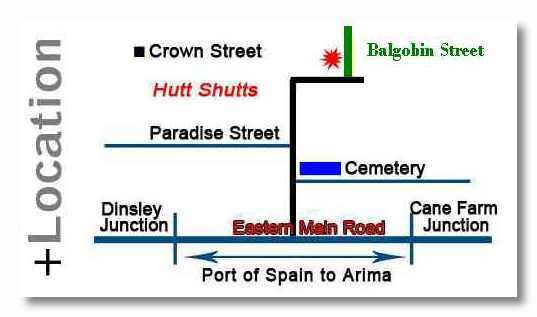 From Port of Spain proceed East along Churchill Roosevelt Highway toward Arima. After passing Omera Road take the left exit at the 4th traffic light, Cumuto Road. Drive until you reach the Eastern Main Road. Across the Eastern Main Road you will see sign Height of Aripo. Enter. Drive until you reach community center. Follow the HHH signs. Food on sale: Fried rice, chow mein, noddles, baked chicken or fish, fresh salad – $40/$45. On After – Coco Bar. 2) Our sponsors will be on site for T-shirt distribution from 2pm. Please come early to secure your size . (S M L XL). T-Shirts are dri-fit so we ask that you wear it for the run. T-Shirts are gifted on Saturday only. 3) The run begins promptly at 3:30pm. 4) Please be mindful of the traffic situation on the highway and between Eddie Hart and Dinsley junction on as Saturday. Please leave home with enough time. 5) There is usually a dress code at HuttShutts, which will be overlooked to accommodate Hashers. Our entrance is from the back of the building and up the stairs. 6) Please don’t skip or hurry away from the beer stop (ooops, did I just let that cat out of the bag?). Hang around for the photo-op. 7) Food on sale: $40 – fish, chicken, veggies. Available inside. 8) Please be in place for the down downs which will also take place inside. On On for the 1000th time!